All Lentry Lights models which previously had Honda EU2000i generators* now feature instead the new, more powerful Honda EU2200i. 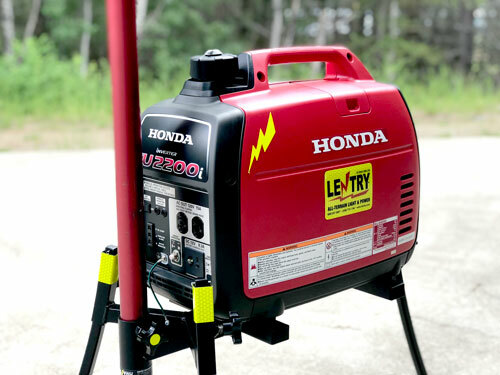 the Honda EU2200i, even if the photos still show the 2000-watt generator. We are working to update all of our product information for our clients and partners. Of all elements that must change, photography takes the longest! Many Lentry Light Systems may still be shown in images with 2000-watt generators but they now come with 2200W generators. The photos will take a while to update. This affects every Lentry Light Model with a model number that begins with the number 2. Bid specifications sheets are up-to-date for all models. See them all here. Product pages in the catalog are up-to-date except images. Downloadable literature is up-to-date except images. Not sure if the specs you see are up-to-date? Compare 2000- and 2200-watt generator specs here. * Or the international equivalents such as the Honda EU20i. Visit with us at the IFCA Conference, this May in Coeur d’Alene. Discover how your fellow firefighters are quietly making outSTANDing fans and lights, right here in your back yard. Ventry Solutions, Inc will be an exhibitor at Expo Seguridad Mexico 2019. We will be located inside the State of Idaho Booth #2925 within the USA Pavilion. Here we collect show stats, dates, locations, etc. Ventry Solutions will be an exhibitor at Fire Department Instructors Conference and Expo (FDIC) 2019. Here we collect show stats, dates and locations, and fun photos. We’d love to hear from you and will be happy to answer your questions and assist you with our products. Call (888) 257-8967. Sign up here for our once-a-month email of GREAT NEWS!